And the shoe in question is the Vibram Five Fingers, a weird and wonderful looking shoe that is as close to barefoot running as possible, without running just in socks. 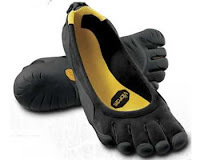 The shoe i have been using is the Men's Vibram Five Fingers Classic, one of many from the series of Vibram barefoot running shoes, and once i had carefully prised them onto my feet, locating each digit in their respective home, i found the feeling and fit very comfortable and natural (despite the roars of laughter from my wife and daughter). The only thing is that you have to learn to run again with these on, you cannot head off straight away for a 10 mile run, with your usual stride pattern. The change in gait and footfall, back to the natural way of running, is totally different from being in a cushioned, shall we say "normal" road running shoe, and once the fear of stepping on something nasty and sharp has abated it feels surprisingly free to run like this. The shoe itself is a combination of Vibram's great gripping rubber soles that add a good level of protection and stretch fabric upper, easy drying so that it can be machine washed should you find that muddy puddle. The grip from the sole of these shoes felt very sure, on both treadmill (where i started and would recommend others to start there too) and road running, (I have yet to venture across rugged trails), and the manufacturer list Bouldering as one of its best uses, and judging by the sole of the shoe the grip look sure enough to tackle that kind of adventure. On a personal level, this is a perfect shoe for both indoor and outdoor use whether it be going to the gym, yoga, summer adventuring in the Rockies or just a quiet 5 miler round the block, but may not be suited to everyone. Before i started using these shoes i did look at a number of reports regarding injuries when using these (mostly about too much reliance on cushioned shoes), and i would strongly advise that if you choose to use these (and i would recommend them strongly) then slowly adapting to the changed style, by even as little as only a few minutes a day, will help you adjust and enjoy spending time on your feet. Great review and a good insight into a really interesting topic. The whole bio mechanics issue is certainly a topic of conversation today.